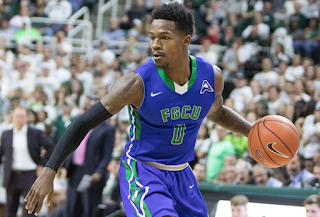 Brandon Goodwin is an explosive point guard for Florida Gulf Coast University. He transferred from UCF (University of Central Florida) after the 2015 season then, last season he exploded onto the scene. He averaged 18.5 points, 4.5 rebounds, 4.1 assists and 1.2 steals while shooting 51% from the field, 35% from 3 and 79% from the line. He led the eagles to a 26-8 record and a first place finish in the Atlantic Sun Conference, with a 12-2 record.The Eagles lost in the NCAA tournament to a talented Florida state team 86-80. Goodwin is already said to be the best player in the Atlantic Sun and is the no. 32 rated prospect in the 2018 NBA draft according to NBA Draft Room. Goodwin has a chance to move into the first round and should capitalize off the great season FGCU had last season and do even more this year. Brandon: Wanted to go somewhere I felt at home, and Florida Gulf Coast provided all the tools I needed to help a team win. LJ: You're an explosive guard and great in transition. What do you think is the strength of your game? Brandon: I feel that my ability to get to the rim and finish with floaters or a pull up is my biggest strength. Still working everyday to make everything a strength. LJ: You got serious hops for your size. Ever dunk on somebody that you always wanted to dunk on? Name? Brandon: I always wanted to dunk on any big man or someone taller then me period, so far at school I've dunked on two of them. Antravious Simmons, and Troy Baxter. LJ: Do you feel like you can be effective off the ball? Brandon: I played mostly off the ball this past season and did a pretty decent job, so being able to play on and off the ball is becoming natural for me. LJ: What NBA player resembles your play the most? Brandon: If we went with former players. I'd say Allen Iverson. For current players, It would be hard to say. LJ: Do you have an NBA team you would love to play for the most? Brandon: I would love to go back to Atlanta or either team in Florida. However, it would be a blessing to be drafted period. LJ: Who do you feel is the best point guard in the league? Brandon: I don't think there is a point guard that is the best. They all do different things that make them stand out, but if I had it my way, I would say Steph Curry. LJ: Made it to the tournament, 6 point loss to a good Florida state team. What are your expectations this year? 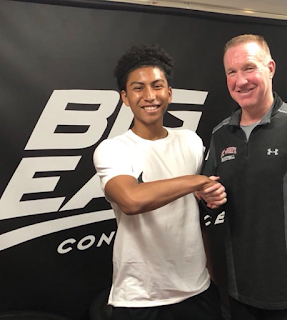 Brandon: Be a conference champion. Get to the tournament and win games. Also be the player of the year and win other awards while winning with my team. LJ: Your quick man. Ever shake somebody on the court out their shoes? Who? Brandon: My teammate Christian Carlyle during practice one day. It was crazy, but he's a great defender, which made it better. LJ: You are the 32nd ranked player in the 2018 draft. That's a late first round/early second round grade. What does Brandon Goodwin bring to an NBA team? Brandon: I can bring tons of energy, make shots, and set guys up for good shots. What most people don't know is that I can defend as well, no matter the game I'll go out and give it my all and I feel as though I can do anything a team needs me to do. LJ: Great talking to you Brandon, good luck on this upcoming season! Brandon: Thank you so much, and appreciate the interview. God bless!